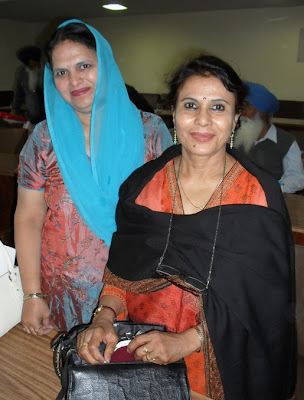 As already intimated on the Jagat blog, I have been in Patiala at the Punjabi University for the past few days, participating in a conference. Here are a few pictures of the place and the participants. Punjabi University has a beautiful modern campus, with well-laid out roads, many parks and gardens, including a botanical garden. 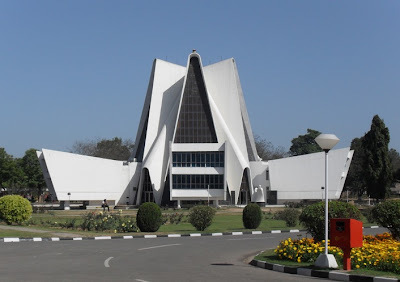 I did not include many of my pictures of the campus as they do not show much that is really unique, but this photo of the Guru Gobind Singh research library gives a general impression of the way that it has been designed. This library has 40,000 books on religion and philosophy and houses the Encyclopedia of Sikhism project, which is headed by Prof. Jodh Singh. 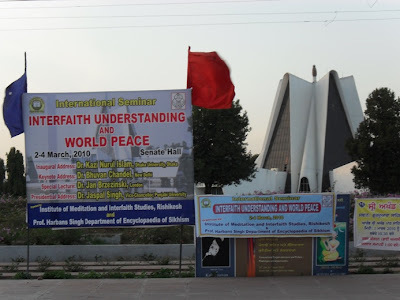 This is the department that hosted the conference, along with Swami Veda's Institute of Meditation and Interfaith Studies. Since I represented one of the hosting organizations, I got top billing! I did not realize it until I saw this on one of my walks around the campus. If you are interested in what I had to say, look here and here. I don't have photos of everyone who participated. This photo shows, left to right, Sirajul Islam, professor of philosophy and Sufism at Rabindra Bharati University, Shantiniketan. I had the fortune of meeting him at the Kolkata conference a couple of months ago, so it was a bit of a surprise to meet him again. To his right is Balkar Singh, head of department for Sri Guru Granth Sahib Studies, who was president of the last session in Punjabi. I could not understand him except for the English and Hindi words he used, but like many of the senior Sikh scholars, he showed a great deal of gravitas and learning, equally adept in using Western and Eastern concepts. Kazi Nurul Islam is the head of one of the most liberal educational institutes in Bangladesh, the Department of World Religions and Culture at Dhaka University. This is the only institution teaching comparative religion in Bangladesh, he told me. Interestingly, my old friend and mentor Joseph O'Connell from the University of Toronto has been affiliated with this department for several years, and from what I gather is making an incredibly valuable contribution to the school, and by extension, to Bangladesh. He has been participating there more actively since his retirement at UofT. Prof. Islam has a Ph.D. in Vedanta from Benares Hindu University, which is where he first met Jodh Singh, which shows a bit how these things work. After me, there is Gurnam Singh Sanghera, who lives in Burnaby, B.C. Missed the winter Olympics to come to this, I guess. 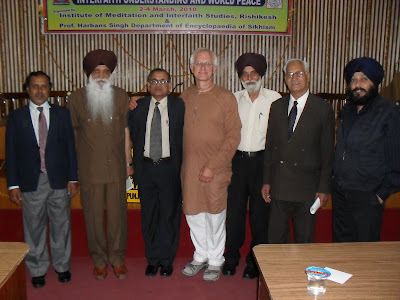 He spoke on "Religion for Peace, a Sikh Perspective." Unfortunately, he tried to condense too much into a short time frame and so many of his very interesting ideas on the causes of bigotry, etc., were not developed. Dr. D.N. 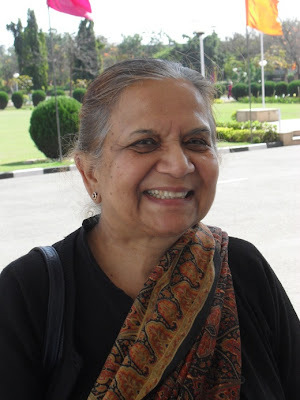 Gangadhar from the Philosophy and Religions Department of BHU is a scholar of philosophy and has done a lot of work on Radhakrishnan, specifically. Last is Hardev Singh from Jammu University. He spoke in Punjabi, so I did not fully understand it, but we had some good talks together. This is D.A. 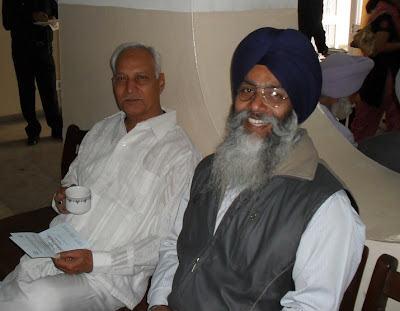 Gangadhar with Paramvir Singh, one of our hosts. He is a contributor to the Encyclopedia of Sikhism and had just come out with a book, Sri Guru Granth Sahib: Chintan ate Vichara-dhara. Dr. Bhuvan Chandel, Secretary of the Center for Studies in Civilization, Science and Culture, New Delhi. She gave the keynote address, mostly speaking on Islamic philosophy.